If there’s one person who had many, many opportunities to be stressed out – and pretty much all the time – it was Charles D. Spielberger. By the standards of some of his own assessments developed to measure stress, he was in the thick of it. His professional life was demanding. He traveled the world. He was a leader on numerous projects and research endeavors – often simultaneously. He held high office within his profession. People constantly hounded him for professional references and research assistance. He was evaluated by his peers, and also by supervisors and officials. He planned international conferences. He edited professional journals. He made – and retained – professional relationships with VIPs in the biz. Charles D. Spielberger papers, Boxes M6050-M6062, Cummings Center for the History of Psychology. These are only a few random samples out of 30 questions. After spending the better part of the last three years sorting and organizing the vast collection of materials that comprise the life of Charles D. Spielberger, I can say with a fair amount of certainty that he experienced any number of the above situations on a regular basis. And just how well did he respond to these potential stressors? I suppose we can never know exactly how Spielberger felt inside at any given moment, but after getting to know him a bit through organizing his life in professional papers, I have two separate impressions of how Spielberger possibly handled his own stress. 1.) It would be quite difficult to accomplish all that he accomplished through a career spanning six decades if he did not handle stress well. 2.) On the other hand, his long incursion into stress was insightful and somewhat sympathetic to the ever-present afflictions of anxiety, nervousness, tension and worry attributed to stress that affect so many lives. It seems difficult to spend so much time on a topic of research and develop such acclaimed assessments about stress if he didn’t perhaps feel the nagging results of it from time to time. We all process and react to stress differently depending on a number of factors. And this can make a big difference when it comes to how we live our lives. For Spielberger, stress was apparently not debilitating, though he knew full well it could be for some. I would contend that Spielberger may have even enjoyed some of the byproducts of stress – endorphin rush, pushing himself to do better and do more. 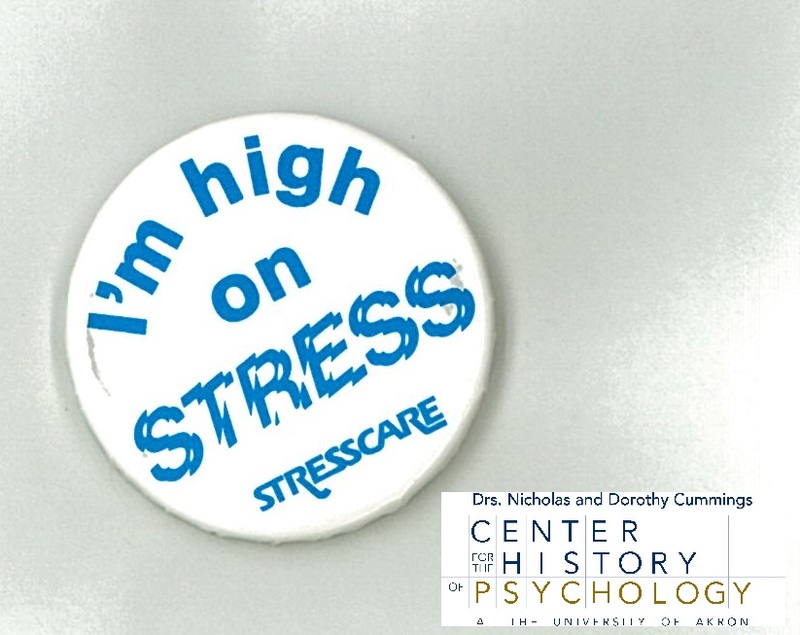 Promotional button for STRESSCARE Systems, Inc., Charles D. Spielberger papers, Box M6034, Cummings Center for the History of Psychology. As a member of the National Scientific Advisory Council for STRESSCARE Systems during 1985-1988, Spielberger lent his growing expertise on stress to this, and many other, workshops that gave people tools to understanding their own personal stressors and how to live with them, if not completely eliminate them. 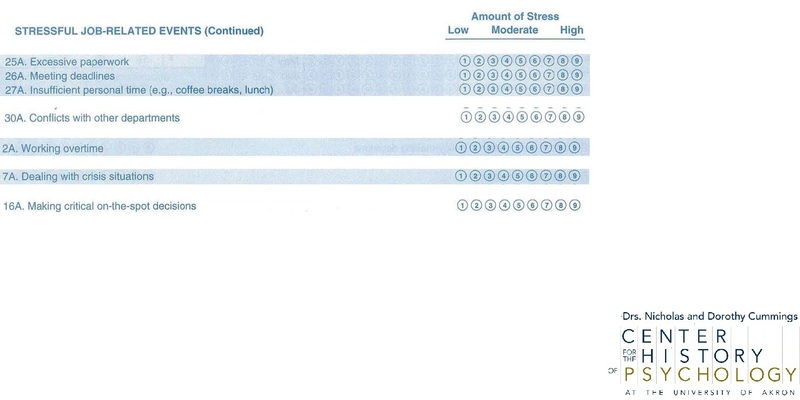 An early assessment test developed by Spielberger, the foundation for which many other assessment tools were built upon, lists and aggregates feelings associated with stress and anxiety. Many adaptations of the STAI (below) were developed for children, personalities, countries, vocations, and other situations. Some of Spielberger’s most interesting and currently relevant work was done in the area of police stress and subsequent selection of police officers. 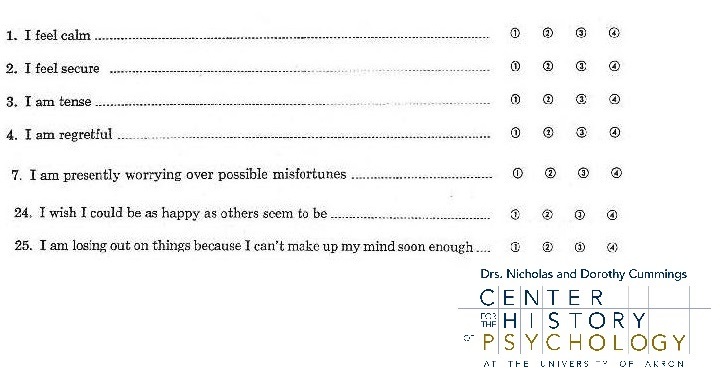 Sample questions from early edition of the State-Trait Anxiety Inventory (STAI) developed by Spielberger, R. L. Gorsuch and R. Lushene, 1968; Charles D. Spielberger papers, Boxes M6094-M6102, Cummings Center for the History of Psychology. Lest you think stress was all Spielberger was about, think again. His infinite curiosity and tireless industriousness made him open to all sorts of life experiences, including retiring from the U.S. Naval Reserve with the rank of Commander – and meeting with Carl Sagan. 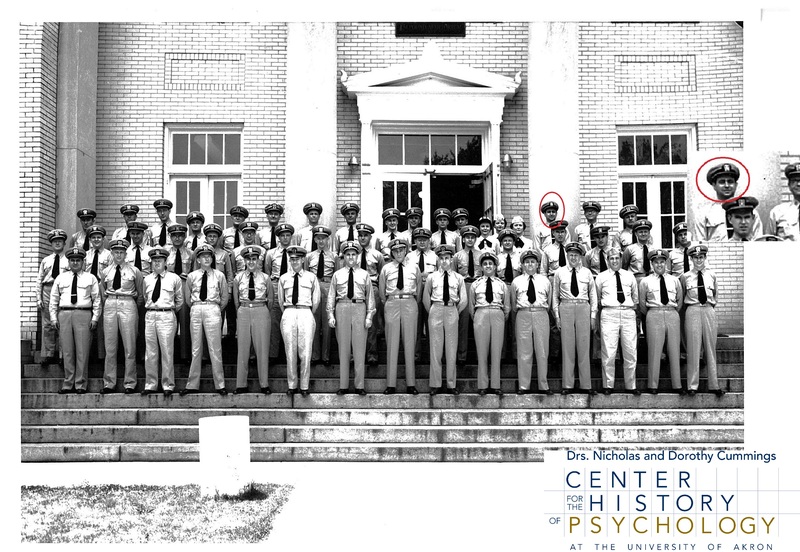 Charles Spielberger (3rd row, 3rd from right), Commissioned Officers Training Course, Ninth Session, 1955; Charles D. Spielberger papers, Box M5875, Cummings Center for the History of Psychology. 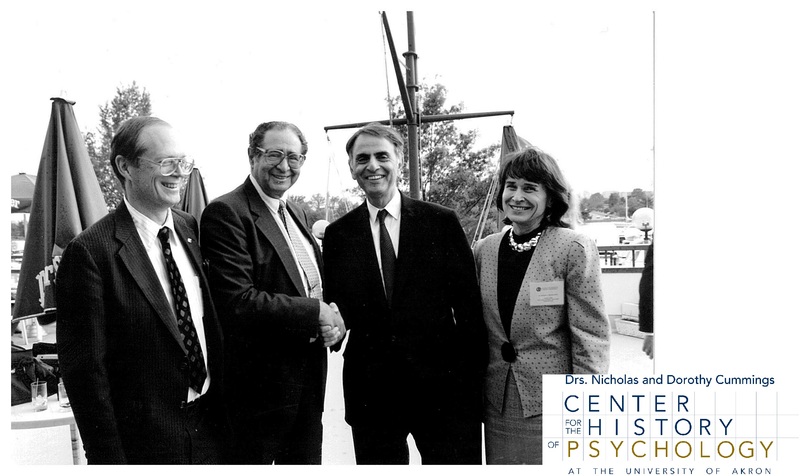 Spielberger, as the University of South Florida Distinguished Research Professor, congratulating Carl Sagan, first recipient of the Carl Sagan Award for Public Appreciation of Science, 1993; Charles D. Spielberger papers, Box M5870, Cummings Center for the History of Psychology. Spielberger served as the 1991-1992 APA president. This professional watermark is a culmination of a professional life steeped in research, contributions to the field, making connections and forging friendships. All rewarding, but certainly stressful as well. 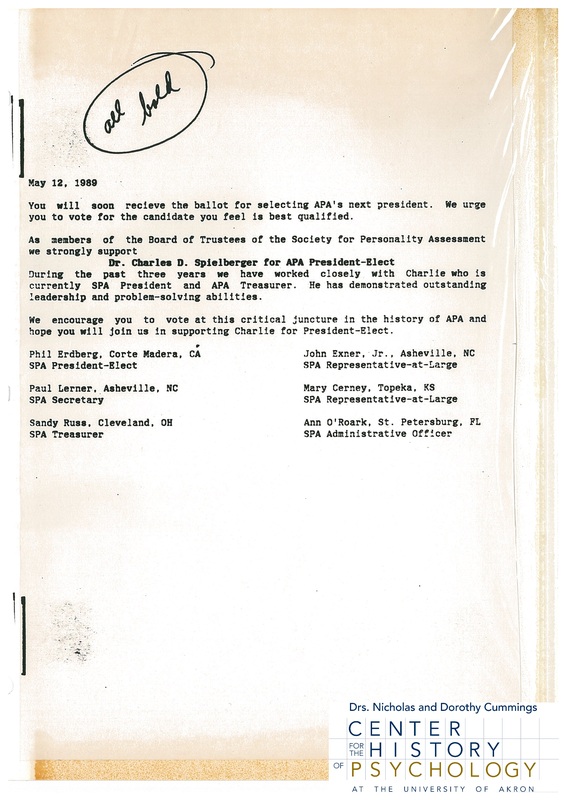 Endorsement letter for Charles Spielberger as APA President, Charles D. Spielberger papers, Box M6215, Cummings Center for the History of Psychology. 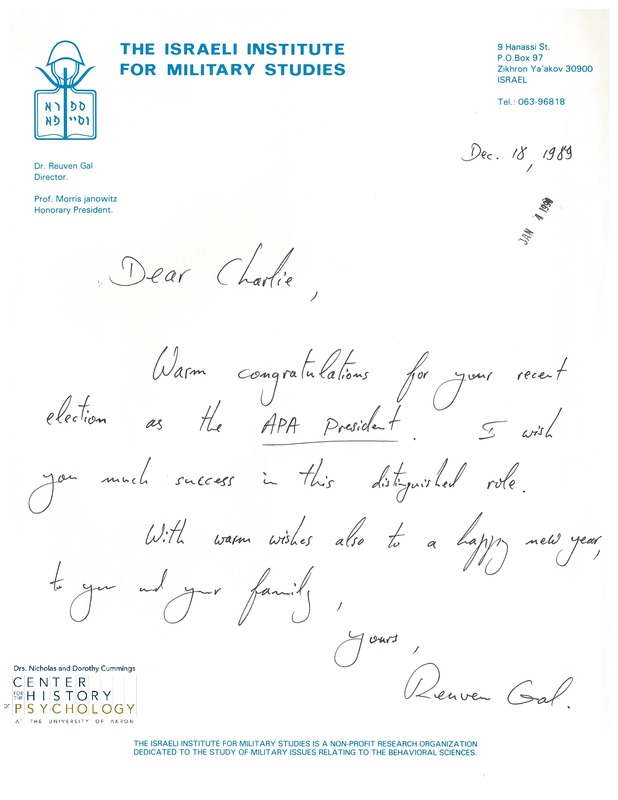 Congratulatory letter to Charles Spielberger from director of The Israeli Institute for Military Studies, 1989; Charles D. Spielberger papers, Box M5619, Cummings Center for the History of Psychology. Others continue to build upon Spielberger’s legacy by using his research and adapting his tests globally to further our understanding of stress and its effects on our lives. Something that Charles Spielberger noticed as a human commonality. See what more you can discover about Charles Spielberger – and possibly yourself – by delving into the Charles D. Spielberger papers, now open for research at the Cummings Center.